Panel two is especially awesome to me for some reason. I love her expression and the windblown hair going on. It makes her look so serious. And I love how whatever that is that she just spotted (A brownie? Or is that the wrong flavour of Celtic mythology?) is just as spooked by her as she is by it. Yes, now he’s the owner of a butterfly-catching business and his employee does the work. Life is good for him! There’s not as much information out there on the brownies or pixies of Ireland. I was originally going to have lots those kinds of creatures in the comic before I realized they’re more prevalent in Scotland and England. So some of them I’ve made up, some I’ve adapted, and this one is modeled after a grogoch, which is similar to a brownie in some ways. Leave it gifts and it will help out around the farm, etc. There are a lot of creatures I’ve had to change in the script because Scottish fae in particular kept creeping into my mind. 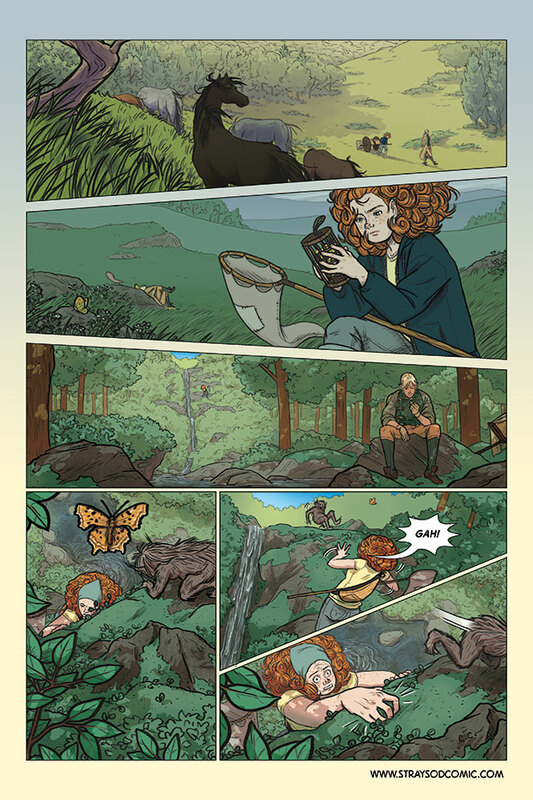 Ina looks content in the second panel, wind blowing through her hair, catching butterflies, I could think of worse ways to spend a day. It’s true. She really hasn’t been appreciating where she is, has she? Did they send me girlies, when I asked… for thugs?